It’s that time of year again, when little ghosts and goblins are roaming the neighborhood for tasty treats. 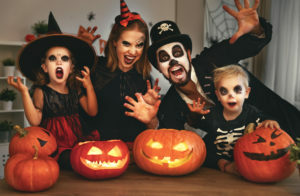 While the night is full of wonder for children participating in Halloween, The Insurance Center would like to remind families that October 31st is one of the most dangerous times of the year for kids. Safe Kids Worldwide states that children are more than twice as likely to be involved in an automobile accident on Halloween. There are several factors that contribute to this startling statistic, according to a joint study by Safe Kids Worldwide and FedEx. To help kids stay safe on this hallowed night, The Insurance Center is sharing this checklist for families and motorists to keep in mind. Halloween can be one of the most exciting times of the year for children, but adults have a responsibility to ensure they remain safe. The Insurance Center encourages families to have an enjoyable night to remember, but we urge parents and motorists to heed the precautions listed above. For other ways to protect your loved ones all year round, speak with one of our independent insurance agents by calling 603.542.2551.